I grew up going to church, so after hearing the same stories over and over again, I get desensitized because I think I know them inside and out. This happens especially around Christmastime. But if you read closely sometimes you’ll find that people’s reactions to things that happen can be pretty hilarious, and suddenly they start looking more like people instead of characters in a book. 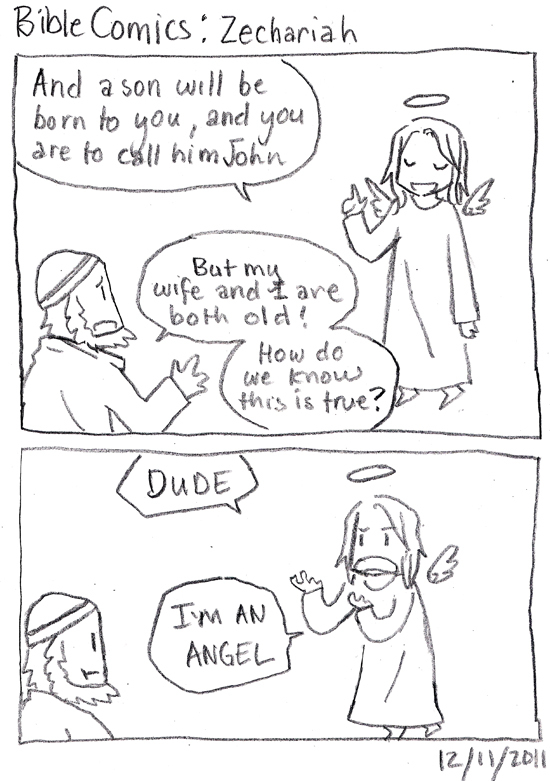 Anyway, you’d think that if an angel showed up to tell you something, you’d believe him. NOPE. I just started reading your comics and am starting from the beginning because I refuse to read storyline in the middle and am addicted to webcomics anyway. Either way, omg I love these comics so far. Christian, from an Asian CS major, so relatable! I’m that right now, so glad to have found this comic! Thanks! Glad you’re enjoying it so far!